Scotch Corner: July Guest – Vicky Stonebridge! July Guest – Vicky Stonebridge! 1) What was your first published work? Apart from illustrations in local historical booklets, and comic strips in the small press, there was a children's fire safety book written by children I work with and produced in partnership with the Fire service. It was called Angus Puff, I did all the illustrations under the strict editorship of the children! Everything. I do not understand people who say they lack ideas, its reining them in is the problem. As for inspiring people I am very lucky to work with many, this is one of the main appeals with comics is the collaborative working. The project I am currently working on collaborating with singer songwriter Tommy Beavitt has got the muse all fired up. 3) What would be your dream job to illustrate? I am a huge Romantic and was heavily influenced by the Pre-Raphelites, so any of the classics would be great; My favorite poets, Keats, Burns, Dante Alighieri; Arthurian legends, Celtic Myths and Legends. But also I love folk tales and the scary dreamlike quality they have. To be honest the Russian Art symposium I went to last year to paint on the theme of myths and epics, was as good as it gets. The work I have on the easel and just around the corner is Exactly what I want to do. 4) Tell us a bit about the illustration you've sent? I am illustrating some Russian songs by Vladimir Vysotsky - "the greatest Russian bard of the second half of the 20th century". These songs are being translated by my friend Tommy Beavitt who has previously translated the works of Robert Burns into Russian and performed them internationally. We are working intensely, bouncing the ideas back and forth. To a non linguist it never occurred to me how nuances of language could completely change meaning, just as brushstrokes and colour can. We are working towards a show in Edinburgh this August during the festival "Reactions to Vysotsky" at the Scotland-Russia Forum and later at the Inchmore Gallery near Inverness. Also exhibiting will be ceramic artist Allison Weightman and artist John Mikietyn, while Tommy Beavitt will perform recitals of the songs. The song featured in this painting is ОХОТА НА ВОЛКОВ - "who'll come a hunting the wolf?". It is obvious social comment whilst referring to to the traditional Russian hunting technique of corralling wolves along designated routes marked by red flags, to the awaiting hunters guns. 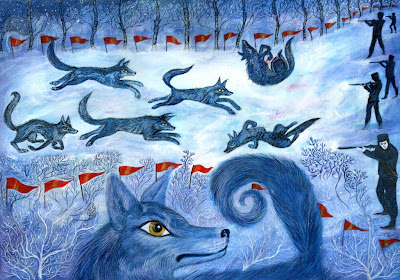 Only the bravest wolves may escape their predefined fate by deviating from the set route and leaping the flags. 5) What can we expect to see from you next (what are you working on)? There will be a few more of these Vysotsky paintings. Then I am working on a comic strip for an exciting anthology called Bayou Arcana. Colouring on a couple of books which will be BIG! I will be working on a graphic Novel interpretation of Scottish travellers tales. As well there are a few painting commissions on the go, everything from Fire fighters to folk art. 6) If you hadn't become an artist what do you think you'd have ended up doing? I also have my Youth work, firefighting, Political activism; I ran a pottery for years, I've also done lots of treeplanting, green projects, manual labour. I could have gone in many many directions but Art is the thing that has stopped me simply going mad! 7) Where can we see more of your work (web links)? Gary Erskine, Simon Fraser, Andy Hepworth, Jon Hodgson, Ian McQue, Graeme Neil Reid and Alex Ronald. Every day there will be a new piece of art* posted, each artist posting on a certain day. This blog is shamelessly inspired and ripped off from the Eclectic Micks. *Art being a sketch, doodle, painting, photograph, blank canvas, whatever. All the art on this website is © their respective creators. No material can be used without the permission of the owner. All the artists are available for hire and can be contacted through their own websites. July Guest – Simon Gane! July Guest – Pye Parr! July Guest – James Corcoran! July Guest – Gibson Quarter! July Guest – Barry Sheridan! July Guest – Tiernen Trevallion! July Guest – David Hitchcock! July Guest – Rob Davis! July Guest – Mike Collins! July Guest – John Higgins! July Guest – Kevin Levell! July Guest - Neil Roberts! July Guest – Robert Thomson! July Guest – Dave Shelton! July Guest – Roberto Zaghi! July Guest – Roger Langridge! July Guest - Garen Ewing! July Guest - Jon Haward! July Guest – Stuart Kolakovic! July Guest - Curt Sibling! July Guest - Nelson Evergreen! July Guest - Anton Emdin! July Guest - Manoel Magalhães! July Guest – Les Edwards! July Guest - Chris Weston! July Guest - James Ryman! July Guest - Jimmy Broxton! July Guest – Bob Eggleton! July Guest - Mick McMahon! Happy 2nd Birthday Scotch Corner!